My 42nd professional development book to review ... only ten books to read on my challenge! To understand how to tackle a crisis and transform a business faced with uncertainty in complex and changing times, look no further. Graham Winter, author of Think One Team has presented his practice into a text book which will no doubt educate, inform, entertain and assist you. 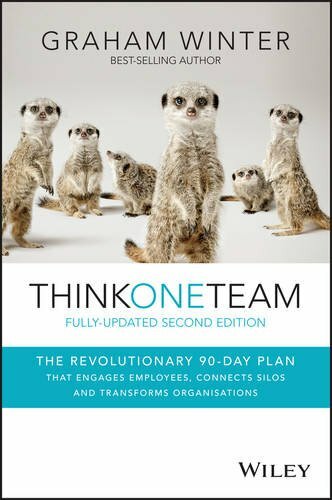 If you’re in Human Resources, take particular note, and if you’re a CEO, an Executive Team member or a curious leader, then I recommend you read Think One Team. It will disrupt the way you think about change! I was surprised to have arrived at the middle of the book in one sitting – I was immersed in the narrative of a fictitious company with the crusader consultant Nick Fox wielding his ‘think one team’ philosophy, method and power tools to transform a businessin a nimble and adaptive approach in turbulent times. There are many additional elements of the change solution, however, I’ve given you a taste of what to encounter if you read Think One Team. Or, jump onto www.thinkoneteam.com and access the tools mentioned. I felt proud reading this book; as a consultant, our goal is to add value working with clients. We observe, we use tested models, techniques, tools and it’s in our interest to make your organisation successful.